If you are looking for a plan that will enable your family to sustain the same lifestyle even in your absence, this plan is for you. If you are looking for a plan that will enable your family to sustain the same lifestyle even in your absence, this plan is for you. Aegon Life Easy Protect Insurance Plan deals with your concern and ensures protection for your loved ones – at a fraction of the cost and without medicals! Mr.Mahesh (age 35 years) is employed with a private firm. His wife does not work and they have a son Ajay, who is 10 years old. Being the sole bread earner of the family, Mahesh is aware of the need to secure his family financially. He knows his personal saving alone cannot suffice and help his family with a regular income. Hence, he relies on Aegon Life’s Easy Protect Insurance Plan. Death Benefit = Rs.10,000 each month for 10 years. Hence, total payout is Rs.12,00,000. Step 3 Please double check all personal and product details at this stage. For more details on risk factors, terms and conditions, please read sales brochure and benefit illustration carefully before concluding a sale. Please consult your tax advisor for details. This is a non-linked, non-participating life insurance plan. This document is for benefit illustration purpose only and should be read in conjunction with the sales literature to understand the product. The guaranteed returns under this policy are clearly marked“Guaranteed” in the illustration table. 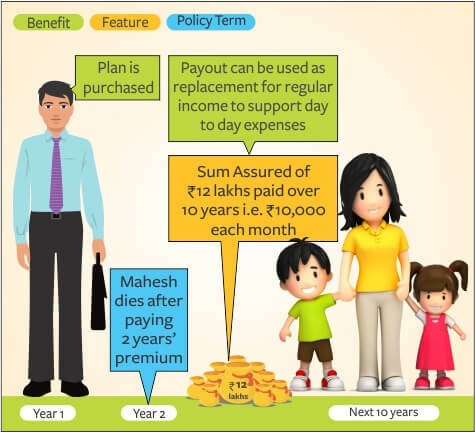 This illustration assumes that all the premiums are paid when due.